We live in the desert in a 5 bedroom apartment, about 1300 square feet. We don’t have central air :) Instead, we have 3 mini-split air conditioner wall units: One in the master bedroom, one in a kid’s bedroom and another in our living room (and let it be stated that it’s about 20 years old and sounds like an airplane while it’s on). We’ve lived in our cozy apartment for 7 years, the first 5 years we were renting and then became proud owners about 2 years ago. We had many projects in mind to improve the apartment. Many of the upgrades we wanted were cosmetic but our priority was functional improvements that would improve the quality of our life. Therefore, we finally decided to take a big ‘to-do’ off our list and install ceiling fans in every room, i.e. 7 ceiling fans. The project was super successful and it’s because we did it right and learned from our past mistakes. Our motto is to do things right the first time or don’t do them. Therefore, we decided to thoroughly research everything about fans, including which fan size was best for each room as well as brand quality. We don’t have the time or money to replace the fans in a couple of years and so we really wanted to do this right. In addition, because we get so much dust in the desert, it was important to get a fan with a top quality motor, the logic being that a better quality motor will withstand the dust better than a cheaper one. The first step was talking to family and friends who had ceiling fans. But not just any family and friends…only the ones who we knew prioritized quality as we do. It may sounds trivial, but in the past we would use a lot of recommendations from friends and family but we never realized that not everyone sees or values quality in the same way that we do. Most of our family had the same advice to share which was that buying the highest quality didn’t really pay off in a significant way and that going for the medium-high quality was more than sufficient. So that’s the quality level we decided to go with and look for. 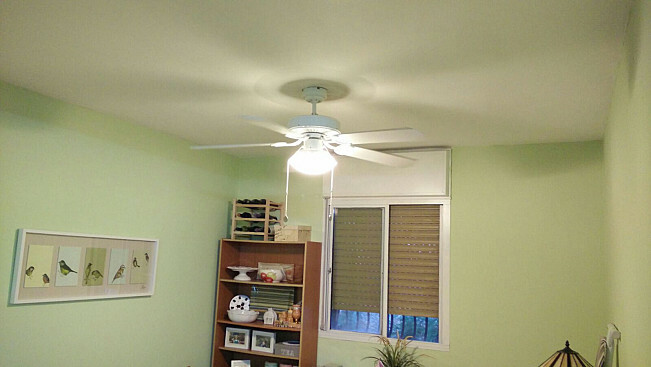 We also specifically spoke to friends that had their ceiling fans for several years already. We wanted to know if they had issues with the motor making noise after time or if the fan became loose after time. Those were our biggest concerns. In terms of brands, we did research online as to where the fans were made – not just where they are assembled- but where the motor itself originated from and where the motor itself was also assembled. The next step was determining the blade size which was easy to research online- there are so many great resources for that online. We are not DIY’ers! We knew we’d need a top quality reliable electrician to do the work. 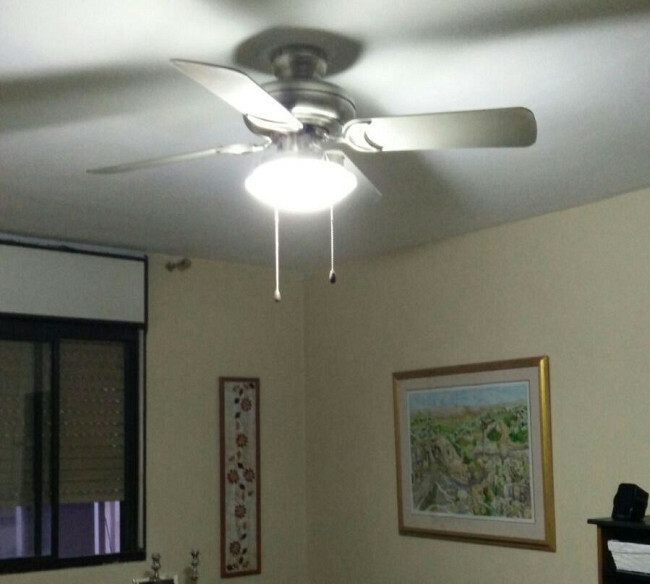 Perhaps if we had one ceiling fan to install we would have DIY’ed it or given it a try. But with 7, we said no way! We used our friend’s electrician, who they highly recommended and he exceeded our expectations. Not only did he clean up after his work, but he made suggestions for things we did not even think about, such as a duo-wall switch- one switch for the light and one switch for the fan. We had assumed that we would turn the fan on and off from pulling the string on the fan- so that was fantastic that he suggested the duo-switch. We learned some big lessons from this project. 1) Small-ish upgrades are SO worth it and can really improve the quality of your life significantly 2) Research is worth the time…and money 3) Speaking to ‘normal’ friends and family is a great way to educate yourself and prevent costly mistakes. Garage Storm Door Installation at a Good Price by Brandon M.